A Kampot gem, Champa Lodge offers a quiet retreat with beautiful river views. Champa Lodge is the perfect spot to hide away and enjoy the lazy Kampot river vibe. The grounds are beautiful and well maintained, with a small private beach on the river. They’ve got a lovely garden where they grow many of the vegetables and herbs that are featured on the menu of their small restaurant, which serves European and Khmer cuisine and carries a wide range of imported beers as well as local Rumblefish ginger beer. Champa Lodge features traditional Cambodian wooden houses set on a lush, green grounds. Guests at Champa Lodge have a range of activities available to them at the lodge, including kayak rental, chartered longtail boat trips, and mountain bike tours. 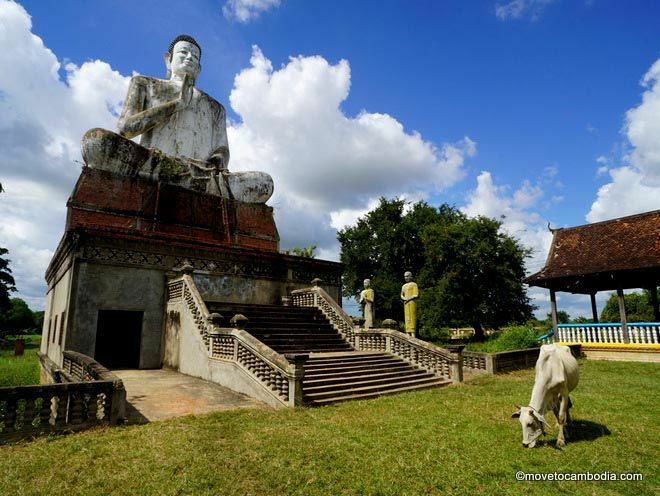 The staff can also arrange activities and tours off the grounds, including bird-watching tours, caving, rock climbing, and dirt bike tours around Kampot. But of course the best activity is just hanging out by the river, watching the world go by. Luckily there’s a viewing platform to do just that. 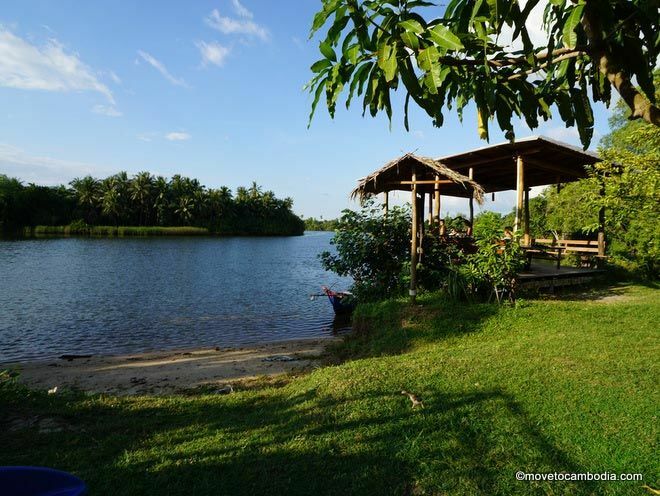 The most beautiful lazy Kampot river experience in town. 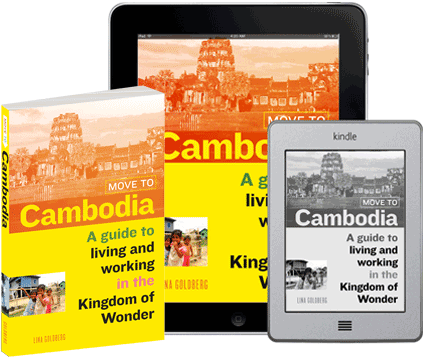 With just five rooms spread across three Khmer wooden houses, Champa Lodge is perfect for families who want to book an entire house or private parties that want to rent the whole place. The rooms can sleep a total of 12 people; with extra beds and and a few people in hammocks, private groups of up to 22 people can stay. To rent the entire place costs $300 per night, with a minimum stay of three nights. 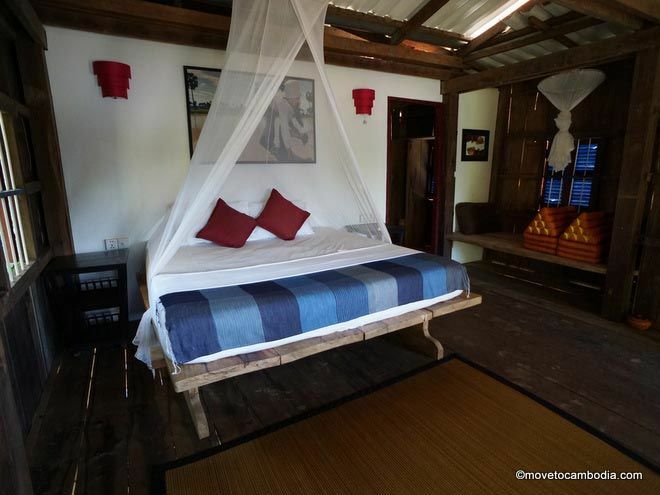 Because the rooms are in traditional Cambodian wooden houses, they are fan cooled. During hot season this can become uncomfortable for those who are heat-sensitive. Rooms are well-appointed, with artwork on the walls and bamboo mats on the floors. The large bathrooms have enclosed showers and each house has a balcony with table and chairs that are wonderful for lounging on. 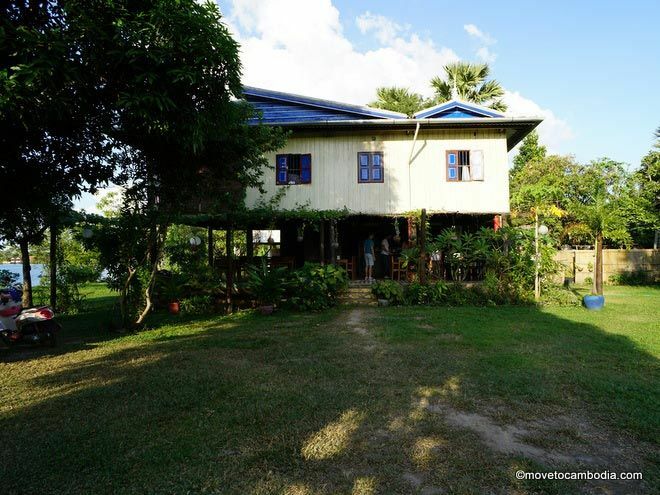 One of Champa Lodge’s wooden houses with room for lounging, plus a balcony outside. They are also happy to accept well-behaved dogs. Room prices are the same whether you book online or directly through Champa Lodge. → Check prices and book a room at Champa Lodge on Booking.com or Agoda now.